Reacting sharply to the findings of the census report, the Delhi Sikh Gurdwara Management Committee has dubbed the religious data contained in the report as fallacious and questioned the projections which put the number of Sikhs in the Capital at 5.5 lakh. Three boys raped a Dalit girl in a broad daylight, when the minor girl was going to a nearby field to relieve herself. Two of the accused had been arrested while the third is absconding. The police had sent the victim for a medical examination. The hunt is on for the third accused. A youth, Prem, was killed by three persons in Gotampuri Mohalla, Dadri. The killers slit his throat and later tried to destroy evidence by throwing acid on the body. The victim had earlier consumed liquor with the assailants. The police have sent the body for an autopsy. A murder case has been filed naming five persons. The Member of Parliament from the Outer Delhi Lok Sabha constituency, Mr Sajjan Kumar, has urged HUDCO to draw up a plan for constructing low-cost dwellings and kiosks in resettlement colonies. Mr Sajjan Kumar said that he and certain legislators of the Capital have met the Union Minister of State, Kumari Selja, and sought her assistance in getting HUDCO to provide the BPL families with financial assistance. The UP Power Corporation has to recover about Rs 12 crore from Khora Colony alone. As the departmental efforts to collect the money have failed, the corporation has decided to ask the revenue department to recover the amount. Each one of them was a winner. All of the 66 youngsters from 34 schools in the national Capital, who spoke for or against the motion in the regional round of the Dr Mahbub Ul Haq Inter-School Debate Competition, organised jointly by the Rajiv Gandhi Foundation and the United Nations Development Programme, presented their arguments with confidence. The Anti-Corruption Branch of the Delhi Police has arrested a clerk of the Municipal Corporation of Delhi for allegedly demanding and accepting bribe from a ‘safai karamchari’ (cleaner). The authorities of the Municipal Corporation Faridabad (MCF) have been served a ‘notice’ by a resident here in connection with its alleged failure to remove the encroachments in certain parts of the town. Putting pressure on the authorities to accede to their demands, four freshmen, along with some NSUI activists, have begun an indefinite hunger strike in the Jawaharlal Nehru University. A notorious criminal of western UP, Rakesh Lala, was shot dead after an encounter with the Meerut police. The deceased was a byword for terror and history sheeter of Sarurpur police station in Meerut. He was wanted in more than two dozen cases of murder, attempt to murder, robbery and dacoity. Gurgaon will have a local branch of the reputed Indian Institute of Public Administration, which has its headquarters in the Capital. 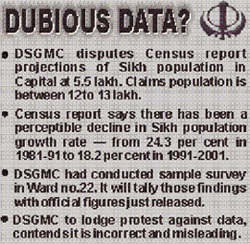 Reacting sharply to the findings of the census report, the Delhi Sikh Gurdwara Management Committee (DSGMC) has dubbed the religious data contained in the report as fallacious and questioned the projections which put the number of Sikhs in the Capital at 5.5 lakh. Claiming that the number of Sikhs in the Capital was no less than 12 to 13 lakh, the DSGMC has alleged that the figures relating to the community in the data were grossly misleading. According to the report, released by Registrar General and Census Commissioner of India J.K. Banthia on Monday, there has been a perceptible decline in the Sikh population growth rate — from 24.3 per cent in 1981-91 to 18.2 per cent in 1991-2001. Describing it as a conspiracy against the community, the DSGMC has alleged that it was part of a “plan to deprive the community of its fundamental rights”. At a meeting convened in Gurdwara Rakab Ganj today, the DSGMC decided to lodge its protest against the report and urged the members of the community to express solidarity on the issue. The committee also criticised BJP leader Yashwant Sinha for his remarks against Prime Minister Manmohan Singh and demanded an immediate apology from him. “ Mr Yashwant Sinha calling the Prime Minister a “Shikhandi” is undemocratic. Such language should not be used in a democratic set-up and he should immediately take his words back,” DSGMC president Parhlad Singh Chandok told The Tribune. “The confidential report had shown the number of Sikhs in Delhi to be around 5.90 to 5.95 lakh. This, we felt, was not correct and decided to conduct our independent survey. We plan to tally our results with the official figures and see where and what has gone wrong,” he added. Mr Chandok said that since there was little awareness about the census report and the data contained in it, the people were not aware of its implications. “Future development of the country is based on the report and its data is an important criteria for measuring the progress of any community, “ he added. The “incorrect figures”, he said, would hamper the political and economic growth of the community in Delhi. This was amply demonstrated by the fact that even though the government had given Punjabi the status of a second language in Delhi, the notification had not been implemented so far. DSGMC advisor Pushpinder Singh, who is part of the Census Fact Finding Committee which was set up in August 2001, said conservative estimates would put Sikhs at around 10 to 12 per cent of Delhi’s total population of 1.34 crore. The DSGMC also took up the French turban issue with Mr Chandok declaring that they planned to write to the United Nations, seeking protection for Sikh rights in France. Thursday in village Johri of Baraut area. The girl was on her way to attend the call of nature when she was dragged to a nearby sugarcane field by three boys Satish (14), son of Bhavanar Singh, Rajkumar (15), son of Bhopal Singh and Akhil Sharma (16). The boys were already positioned there to sexually assault the girl. According to girl’s father, the trio accosted her as she passed from the field of one Bhole Singh. Nobody was there at that time. The boys dragged the 13-year-old girl to the field and repeatedly raped her. They fled from the scene as the girl fainted. After sometime, the victim reached her house and narrated the story to her family. Anger gripped the whole community in the area and hundreds of Dalits rushed to the spot and started a hunt for the culprits. The matter was also reported to the police later. The Binauli police arrested Satish and Raj Kumar while the hunt was on for Akhil. SHO Binauli PS said that one of the accused had admitted his crime while the second was changing his statement. pornographic material with the other youths of the village which perverted their minds. The police and the administration officials have visited the village Johri amidst tension. The police and the PAC were also deployed as a precautionary measure. Meanwhile, the family of the victim is living in terror. A youth, Prem, was killed by three persons in Gotampuri Mohalla, Dadri. The killers slit his throat and later tried to destroy evidence by throwing acid on the body. The victim had earlier consumed liquor with the assailants. The police have sent the body for an autopsy. A murder case has been filed naming five persons. A large number of people had blocked the GT Road chanting slogans against the police and demanding arrest of the culprits. A monetary dispute is said to have triggered the murder. The deceased was a driver in Delhi and had come home on leave on Rakshabandhan. Three persons had taken him along from his house on Thursday to Roopwas Garden. All of them had drinks after which the three killed Prem by slitting his neck. The trio then dumped the body in the jungles behind grain market. The assailants later tried to destroy the body by throwing acid on it, but the acid did not burn it completely. Some women who had gone to the jungle to fetch firewood noticed the body. They informed the people in town. A monetary dispute is said to be the cause of the murder. Hundreds of people of the Gotampuri Mohalla had gheraoed the police station and jammed the GT Road, demanding the filing of case against the five accused. The police had earlier registered a case against Rohit and Brijesh only. Brijesh has been arrested and a bottle of acid seized from him. The Member of Parliament from the Outer Delhi Lok Sabha constituency, Mr Sajjan Kumar, has urged HUDCO to draw up a plan for constructing low-cost dwellings and kiosks in resettlement colonies for the benefit of the people living there. Mr Sajjan Kumar said that he and certain legislators of the Capital have met the Union Minister of State, Kumari Selja, and sought her assistance in getting HUDCO to provide the BPL families with financial assistance. In the last few years, he said, 10 resettlement colonies have come up on government land in the Outer Delhi and the East Delhi parliamentary constituencies. The government agencies’ responsibilities, he alleged, were limited to providing plots of land. The Lieutenant Governor, Mr Banwari Lal Joshi, today laid the foundation stone of a guesthouse and commercial complex at the Netaji Subhash Institute of Technology at Dwarka. The complex will cater to the requirements of daily use of students and faculty alike. The guesthouse will provide accommodation to visiting scientists, engineers, etc. At a special function held in the memory of the children killed by the terrorists in Russia, the children of Deepalaya School prayed for peace and harmony in the world. Carrying placards and posters, they protested against the increasing cases of terrorism in both India and abroad. A student read out the resolution: ‘’We, the children of Deepalaya, India, send our heart felt condolence to the bereaved families of the innocent schoolchildren of Russia, who lost their lives in the worst ever act of terrorism in human history. “We appeal to the thoughtful world leaders to find an everlasting solution to the global problem of terrorism and let the children of the world breathe freely under the same sun’’, they appealed. 30 seconds silence in memory of the deceased children and others, said a spokesperson of Deepalaya. A list of 50 major defaulters in Khora has also been prepared by the electricity department. Each of the defaulters owes the UPPC more than Rs 1 lakh. About 8,000 consumers owe the corporation less than Rs 1 lakh each. All this, according to the UPPC sources, adds up to Rs 12 crore. The corporation had sent notices to 900 power consumers in the colony last month who owe Rs 275 lakh to the corporation–only 2 per cent of them have contacted the corporation office to deposit their bills. Recovery Challanes (RCs) against 50 major defaulters have been issued. Salag Ram of Pawan Vihar owes Rs 1.90 lakh, Suraj Narin of Indira Vihar owes Rs 1.45 lakh, Krishan of Vishwanath Colony Rs 1.35 lakh, Sukhpal of Pragdi Vihar owes Rs 1.27 lakh, Jai Praksh Mishra of Vandana Enclave has to pay Rs 1.98 lakh, Sewa Ram and Seetal of Subash Park owes Rs 2 lakh each to the corporation. Khora Colony is known to be a difficult area for collecting electricity payment. Many of them refuse to pay even after RCs are issued. According to Executive Engineer Vijay Kumar, the houses in Khora are not numbered systematically. Many people have given wrong addresses. A large number of people run commercial establishments on residential connections. Then a lot many houses have illegal connections of power supply. All these add to the problem of the Power Corporation in the colony. This was conceded by the chief guest, Deputy Chairman of Planning Commission Montek Singh Ahluwalia, at the end of the debate. The topic, “Economic growth alone will ensure the well being of the poorest,” would have stumped many. But the participants, presenting their views with facts, conviction and confidence, made it difficult for the judges to decide upon the winner. But as it happens in every competition, there can only be one winner. And in this case, it was St Thomas School, represented by Mamta Pandey and Nina Kaushik. They will now represent the region in the final round to be held on October 19. Speaking for the motion, Mamta argued that economic growth ensured the much-needed money for funding development projects, which alone could ensure removal of poverty in the long run. Speaking against the motion, Nina argued that economic growth had social plagues like gender discrimination and illiteracy attached to it, and had little meaning for bankrupt farmers in Orissa and the poor elsewhere. Modern School was the runners-up in this category. Emiko from Sanskriti, Chankyapuri, who won the prize for the best speaker for the motion, argued that to provide facilities the government required funds. A developing country like India did not have inexhaustible funds, therefore, economic growth was the only way out, he reasoned. She said India had not benefited despite high GDP growth rate because it had tried to leap straight from agriculture to the services sector without building up the industrial infrastructure to support it. Mother’s International won the prize for the best speaker against the motion. The topic for discussion for the final round is “Respecting cultural identity reduces the risk of conflict in multi-cultural societies”. The winning teams from other centres will compete with St. Thomas. The accused, Vishwas, was arrested by sleuth of the Anti Corruption Branch while accepting Rs 2,000 from the complainant, Vijendra Kumar, at the Civil Lines office of the MCD. According to the police, the accused had asked for the money for preparing the arrears bill of the complainant. At this, he contacted the Anti-Corruption Branch who gave powder-coated notes to the complainant. Later, the police arrested him red-handed. With the arrest of three persons, the Delhi Police claims to have busted a fake currency racket. The police have recovered fake 500 denomination notes totalling Rs 4,500 from them in Northeast Delhi. The accused were identified as Salman Hussain (23), Salim (20) and his uncle, Asif (35). During investigation, Salman and Salim revealed that the notes were given to them by Asif, a resident of Uttar Pradesh, while Asif said he got the currency from a man from Bihar. The police have registered a case and further inquiring into the matter. The President of NASSCOM, Dr Kiran Karnik, released the book, ‘The Ethical Hacking Guide to Corporate Security,’ authored by Ankit Fadia at the India Habitat Centre here. Dr Karnik applauded his efforts in highlighting the problems and solutions pertaining to computer and Internet security. Mr Sanjay Sethi, Chief Publisher of Macmillan India Ltd., said that Macmillan India and Ankit Fadia share a very special relationship. The resident, a social activist, has already filed a PIL in the High Court and claimed that the civic body was liable to be tried for committing contempt of court. The corporation, the activist said, had been violating the terms and conditions of the lease deed regarding the allotment of shops and plots in one of the prime commercial areas of the town. In the notice served through his advocate, the resident, Mr K.L. Gera, has stated that he had got a ‘contempt’ notice served to the local civic authorities on August 3, in which the MCF had been appealed to remove encroachments at Tikona Park in the NIT area here, as per the observations made by the Division Bench in its order on March 12 this year. He has alleged that the authorities concerned had failed to remove the encroachments and said that the work claimed to have been done by the MCF was not up to the mark. It has been claimed that the reported removal of as many as nine basements, 200 ramps and about 90 kiosks from the main spot had been false. He has stated that the verandahs meant for the public were still occupied by the shopkeepers, who were mainly auto dealers and persons repairing vehicles. Expressing dissatisfaction over the progress done so far, the petitioner has pointed out that the majority of the ‘illegal’ sheds and basements were still there and the ‘laxity’ being exhibited by the civic administration so far amounts to a clearcut contempt of court and he may be forced to file a petition in this connection after a few days, if the authorities do not take action against the defaulters. It is alleged that the shopkeepers here had got first, second and even third storeys constructed on their plots. While Mr Gera has announced to take legal action against the MCF, he has also expressed concern over the encroachments done by the shopkeepers in the markets of the HUDA sectors. He has claimed that the verandahs in almost all the markets had been illegally occupied. The officials have been winking at these violations despite the directions issued by the Chief Minister for removal of all encroachments, Mr Gera added. Putting pressure on the authorities to accede to their demands, four freshmen, along with some NSUI activists, have begun an indefinite hunger strike in the Jawaharlal Nehru University (JNU). While the freshmen began their strike on September 10, the NSUI activists joined in here today. “It has been two weeks since we handed over a charter of demands to the Vice- Chancellor, but there has been no action,” said Aleem, Vice-President of the NSUI. The charter of demands submitted by the NSUI seeks more accommodation for students on the campus, a 24-hour health centre and more financial aid for students among other things. “The university is yet to allot rooms in the newly constructed hostels, Lohit and Loni. We want a wing in Loni to be allotted to girls. The library should be open 24 hours a day so that students have access to books and reference material at all times”, said Aleem. The NSUI has also put forth a demand for more buses from the campus to the rest of the city, resumption of bus service to pick and drop students from different libraries across the city and regularisation of bus services on the campus. The construction of an auditorium with a seating capacity of at least 1000 and cable and Internet facilities on the campus are also included in the charter of demands. The renovation of the basketball court outside Tapti Hostel and the construction of a stadium, complete with facilities for all games and sports, and proper sanitation of the stadium have also been sought. With his killing, people seem to have heaved a sigh of relief here. Senior Superintendent of Police, Meerut, Mrs Anju Gupta, while taking over in the morning, gave a strong message to hundreds of criminals in the area through this encounter. During a press conference, Mrs Gupta said that two gangsters had fired on the police at a checkpost and fled towards Meerut bypass road. SHO T P Nagar with the police force and inspector incharge Kithare UK Yadav then started patrolling the area. SHO T P Nagar intercepted two gangsters on an LML scooter. The duo opened fire when the police tried to stop them. The police force returned the fire. One gangster was injured while other escaped, taking advantage of the dense sugarcane fields in the area. The injured was rushed to Medical College Meerut where he was declared dead. The deceased was later identified as notorious criminal Rakesh Kala of village Panchli under Sarurpur police station. His HS No is 3A of 7997 in Sarurpur police station. The police also seized a revolver of 455 bore with some cartridges. He had been a symbol of terror in western UP for last eight years. Gurgaon will have a local branch of the reputed Indian Institute of Public Administration (IIPA), which has its headquarters in the Capital. The move for opening the branch came from the life members of IIPA residing in Gurgaon. In fact, they completed the formality of passing a resolution in a first general meeting of the branch. The meeting was held under the patronage of a former Chief Secretary of the Haryana government and former Director of IIPA, Mr M.C. Gupta. An election was also held for the post of office-bearers of the local branch. The office-bearers elected are as follows: Mr M.C. Gupta-Patron, Mr B.K. Chaturvedi-Chairman, Mr H.R. Bangia-Hony Secretary and Prof (Ms) Amita Singh-Hony Treasurer. Dr Deepak Dogra, Dr (Ms) Neena Bansal and Ms Indu Sharma are the executive members. Toon Games, was held here today. More than 6,000 toon heads had a blast, enjoying games and cheering enthusiastically for their teams. The ‘warring’ teams, ‘Wonder Toon’ and ‘Thunder Toons’ were led by Jerry and Tom respectively. To stake claim to the prize, both teams had to prove their mettle at games like Flower Power, Fuuuutball Hungama and more. The Wonder Toons had Scooby Doo, Fred Flintstone, Bubbles, Blossom and Buttercup while the Thunder Toons included Tom, Johnny Bravo, Mojo Jojo, and Dexter and Dee Dee. 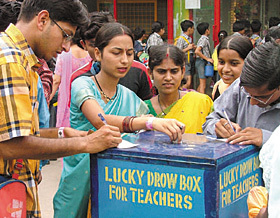 Many interactive, on-the-spot contests were also held during the breaks. 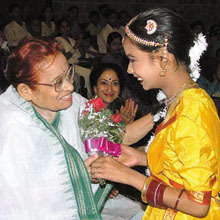 Eminent Gandhian and MP Nirmala Deshpande today said the new generation’s defiance of the elders is not always undesirable as this is how society is introduced to the new ideas. Inaugurating a seminar on ‘Families from different faith perspective’, she said that children should question parents, without which no development can take place. Parents should treat children as friends and respect their views, she advised.